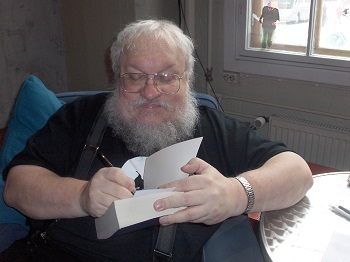 Game of Thrones author George R R Martin announced today that the long-awaited next novel in the series will be available much earlier than anticipated, as he is going to write the whole thing during National Novel Writing Month this November. This marks something of a change in writing style for Martin, given that he usually takes up to ten years to complete a novel. When asked to explain his reasons for upping the pace so dramatically, Martin confessed that after several years of pretending, he has still not actually written a word of the next book, and sees ‘NaNoWriMo’ as his last chance. When asked if he would be able to be able to produce a work of similar length to previous volumes, he conceded that this was unlikely.